Connecticut area home shop machinists are invited to meet with our CTHSM group on 19 May 2019. My very first machining project was a tailstock camlock to make it more convenient to move the tailstock. This was a good choice for a first project since it was very easy to build and yet is a valuable modification of the minilathe. I added a Phase II AXA 100 QCTP. This toolpost looks huge on the minilathe and it makes a huge difference to the way the lathe operates: easy tool height adjustment, less tool chatter, a nice boring bar holder, and a simple mount for the cutoff tool. In addition, it's easy to add a vise to do simple milling: bolt a 3 inch length of 1/2 inch bar to a small vise, then mount the bar in the tool holder - not very rigid, convinced me to get a mill... The height is crudely adjustable using the tool height adjustment of the toolpost. 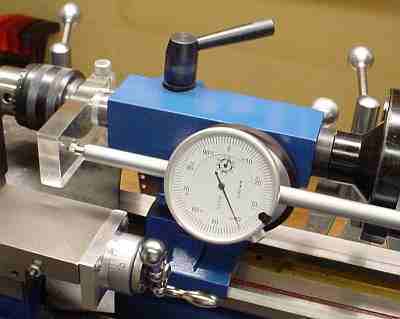 An advantage to this setup is that it takes only seconds to shift from lathe to milling operations. The downside to the new toolpost (and there's always a downside) is that it restricts the size of items which can be turned due to its sheer size; I added the modified compound rest #1777 from LMS to help accommodate this and eventually modified the cross slide to allow more range. This ball turning attachment to fit the minilathe is useful in making ball handles, of course, but is also handy for rounding bolt heads and making Lucite magnifiers. My carriage lock is based on Mike Walsh's design. This would make a useful second project although there is more filing, sanding, and polishing than turning. 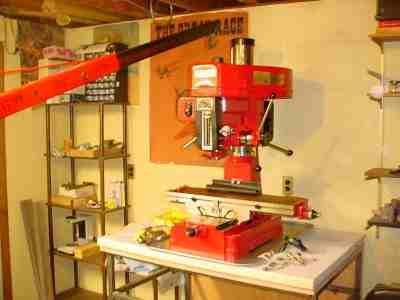 A taper attachment for the mini lathe; it works better since adding struts to stiffen the mounting. Here is a 3C collet chuck to fit the 3MT taper in the minilathe headstock - the raw material for the chuck was a barbell bar. Here's how it goes together. 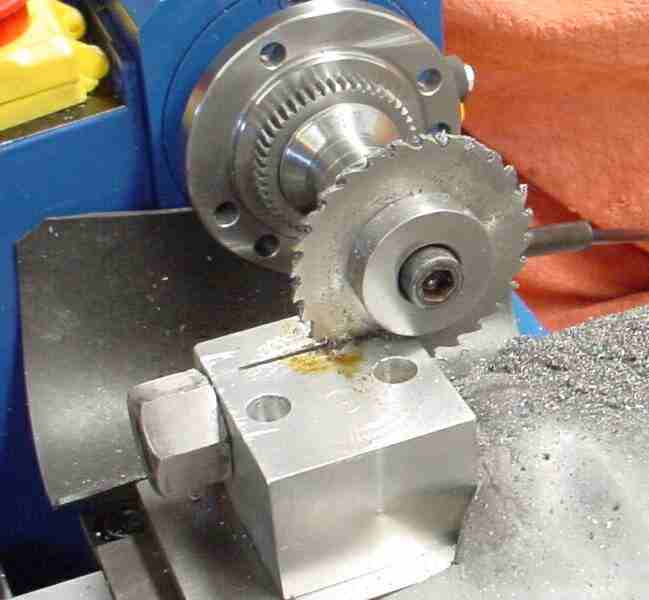 The gear is the chuck extractor, the "?" gadget is a wrench to apply more torque to the gear. 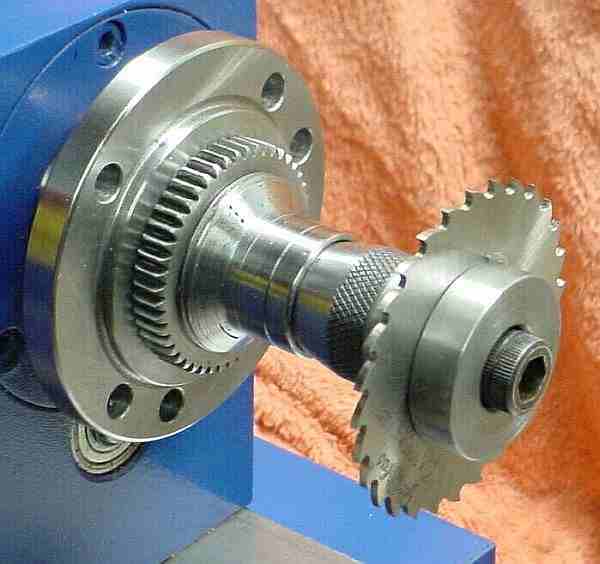 The chuck is shown here in the lathe. 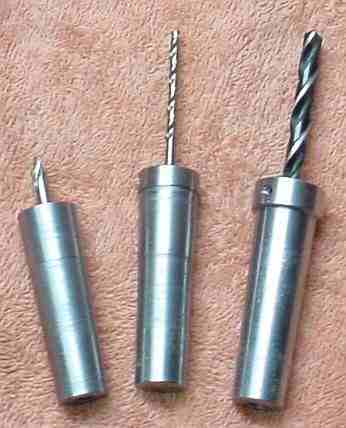 The collets are another part of this project; this is a picture of the raw material, a purchased collet, and a partially completed pair. 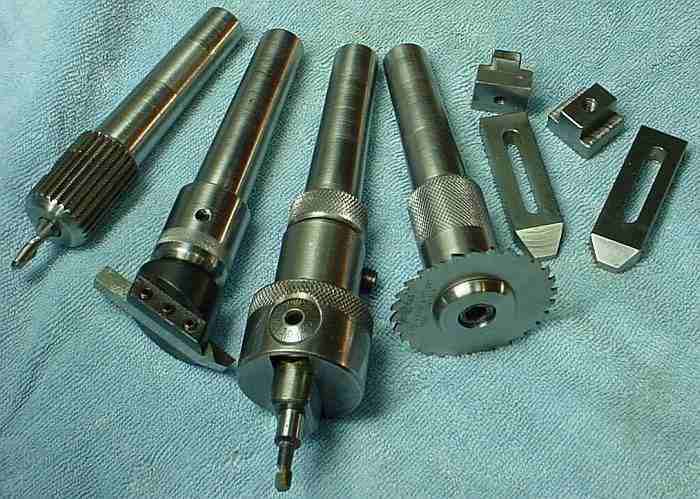 To slot the collets I bought a slitting saw, then made an arbor to fit the collet chuck - here is a picture of the parts. 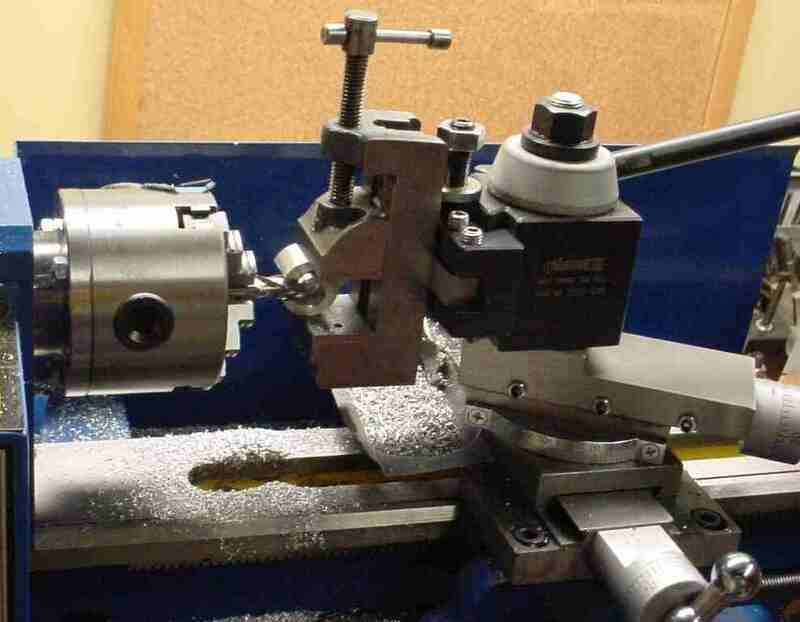 A holder is used to secure the collet for slitting; this is a messy operation where the way protectors earn their keep. Slitting is slow work with this setup but it does the job, witness the collet shown. Unfortunately, this collet was not drilled accurately so it is useless due to excessive runout. Ball bearings were added to the mini-lathe controls, beginning with the cross slide followed by the compound (much easier to do than the cross slide). These ball bearings transform the "feel" of the lathe and are WELL worth adding. The cross feed and compound dials were converted to free spinning with friction lock easy to do, works well, replaces the friction spring under the dial. My original reason for getting a lathe was to make items related to my microscope hobby but I got into fiddling with lathe related stuff. I finally got back to optics related things by making some Coddington magnifiers from Lucite rod. A second Lucite project was an optical center punch patterned after one found on Harlan's site(Disappeared 3/13). A combination carriage stop / dial holder was adapted from EngineMan's design; I copy only the best! 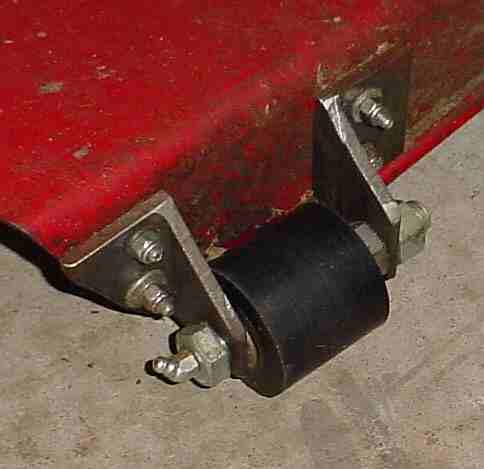 A clamp knurler was built from Martin Cleeve's design. His article suggests using the cross feed to knurl but this puts considerable strain on the cross feed lead screw and nut; using the carriage feed instead works well and puts less strain on the machine. A discarded Nordic Trac provided a 9" hand wheel which is helpful for tapping and for single point threading. Nothing is wasted here at Poverty Acres -- a roller from that Nordic Trac was adapted to prevent the discharge chute on my mower from digging in on steep angle changes. I made several MT2 tapers to hold commonly used drill bits: the cheapskate's alternative to a tailstock turret. When is a tool height gauge not a tool height gauge? When it's a die holder -- you get two for the price of one with this approach. 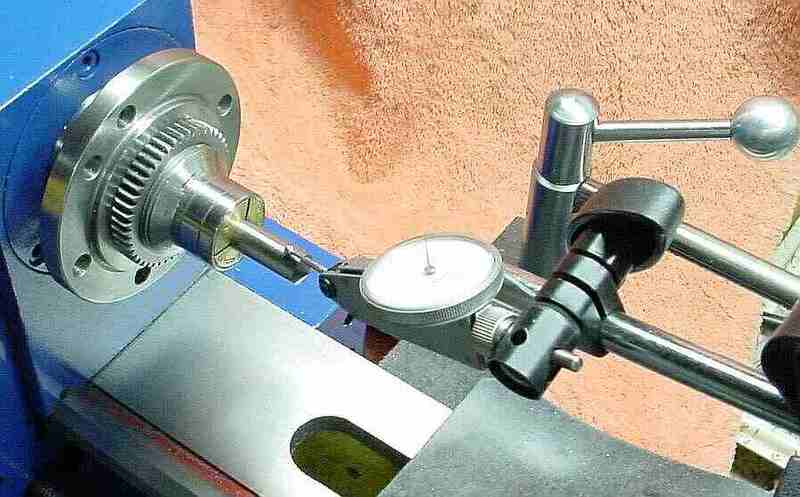 A center finder is one way to simplify use of the mini-lathe's 4 jaw chuck. I copied Varmint Al's idea for a tailstock flag and meter. Used a piece of 1/2" lucite for the flag, the magnet is the rotor from a VCR takeup motor with an aluminum bracket to mount the meter; simple, cheap, effective. The DRO has further simplified drilling to depth. Made a plinth to replace the compound for most things other than threading and tapers. This did not reduce chatter as I hoped so I don't use it much. Eventually I figured out that retracting the compound so the tool point is over the cross slide (not cantilevered out to the headstock side) helps reduce chatter and the plinth I made doesn't allow this. A Homier mill has been added to my shop. This doesn't fit nicely within the title of my site so I don't know exactly how I'll work that out but after wrestling this 700 pound guy down the stairs and onto the table, the mill stays! One necessary adjustment with a mill is tramming. Some shop made mill tooling; the cutter holders are from a car axle annealed in the fireplace (the wheel spline is included on one). Tool holders to fit my Phase II toolpost were on my to-do list for a while; the new mill made many things possible. 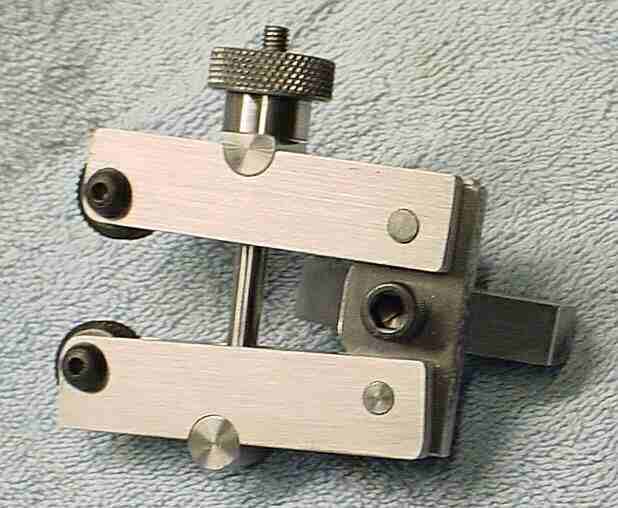 Most tangential (diamond) toolholders don't fit a QCTP; I adapted the Freeby design to fit my QCTP. I get a better finish on steel with this toolholder than with regular toolholders and bits so I now use this for most turning and facing. I made Will Hamlyn's split nut mod to reduce backlash in the cross slide. This didn't work as well as I hoped so I split the old nut lengthwise instead but it cracked when squeezed so I use it with 5 thou backlash. One of my interests is clocks; I made a gear depthing tool which is useful in building a clock -- something which I am attempting at present. I added a page about my clock project and its current state. I got into sharpening drills of various sizes and found one fixture won't cover the gamut -- so I wound up with three. Plus a lever drill attachment to use all those sharp drills. A finger plate simplifies cross drilling of modest size rounds, something that used to take some time to accomplish accurately. I revised the depth stop on my HF drill press (idle hands do the devil's work). This is much more useful than anticipated, well worth doing. Added DROs to the lathe using 6" scales. These are more versatile and therefor more useful than I originally expected. In making the leadscrew for the Brooks-Stent I needed a sharp threading bit so I built the sharpening jig from "Screwcutting in the Lathe" by Martin Cleeve. This jig makes the job fast and easy. A little experimenting with this jig showed that it can be used to sharpen many lathe (and shaper) bits other than threading bits and the results are clearly better than my hand sharpening attempts. The Broadley spindle directions call for a steady rest so I built one to fit either the 7x12 or the Rockwell 10" by swapping the base. Then I built the "Linerator" to add graduations to the Brooks' dials; lots of gadgetry is needed to complete the Brooks grinder. I built a Geo. Thomas "Retracting Toolholder for Screwcutting" to make threading easier and faster. I do a fair amount of threading so I've developed a routine for it which this tool simplifies. Added a mechanical carriage auto-stop to speed up threading. 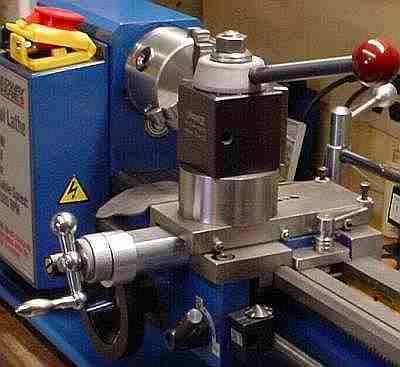 Combined with the retracting toolholder this speeds up threading considerably. 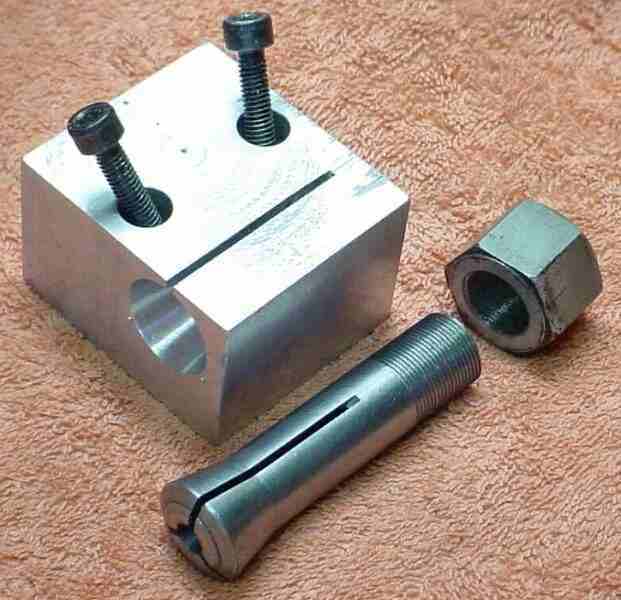 Built a graver rest for the minilathe; a collet chuck or similar is needed to use it safely. An ER-32 collet chuck with pass through was needed to simplify another project. Built a sensitive drill holder; it takes more force than anticipated to drill with tiny drills using this. A gearless clock has taken shape in my shop and looks like it will keep on ticking. As a non-woodworker, the case is an on-going struggle although the temporary case suffices for now. My 4/6 facet drill sharpener with optional point splitter works well for drills from 1/2" to 1/16". Made a tapping guide from a surplus indicator stand. Finished an ER-32 collet chuck for the Rockwell. ER-32 Collets can now be used on the 7x12, Rockwell 10" and the mill-drill. Small tools get magnetized accidentally (magically) in my shop so I made a demagnetizer from scrap plus small neodynium magnets. Small, cheap and it works well. Built a cut knurler as an experiment. Seems to work well, easier on the machine than the pressure knurler but seems a little fussier to set up. Added info on making counterbores from drill rod. Copied Dan Gelbart's Laser Center Finder concept for use with the mill or drill press. Helped a friend make a ball cutter that uses a tangential tool holder, i.e. 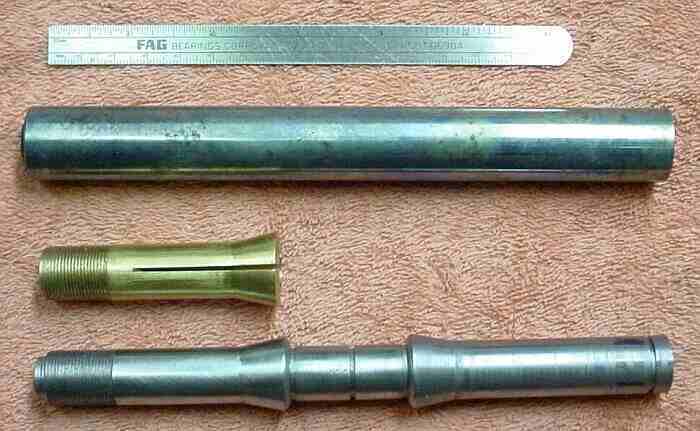 a tangential ball cutter. Built a Tap Chuck mainly to see how the mechanism worked in practice (seems to work well). Made a Lantern Chuck and a Screw Slotter, both of which are likely of interest mostly to clockmakers. Made a knife sharpener to make our kitchen knives work better. Uses modest cost diamond hones to get knives very sharp. 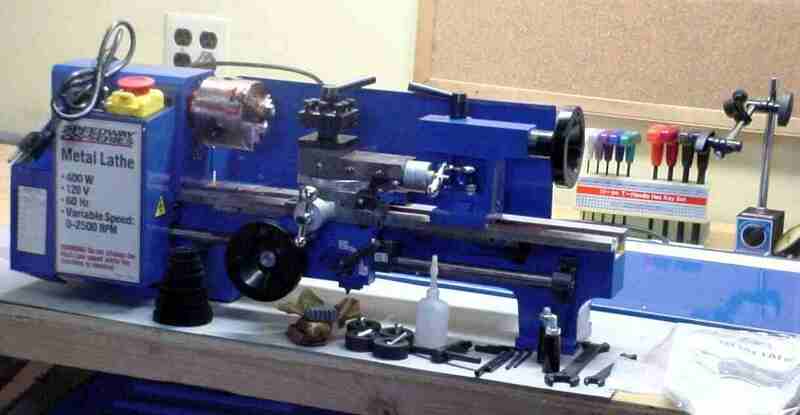 This page was last modified by John Moran, tyro machinist and HTML tweaker. If you have a comment on my site or its contents, click here scroll down and click again.